Complete set of eight original Mughal-e-Azam show cards for sale sealed inside their original carry case cover. Featured here for sale is a complete set of 8 original show cards of the 2004 color re-release of the epic 1960 black and white film, Mughal-e-Azam. Mughal-e-Azam is the first full length black and white feature film in the history of Indian cinema to be colorized for a theatrical re-release. The film's color version was released theatrically on 12 November 2004, with a digital reworked soundtrack. Printed and circulated in 2004, this rare unused set comprising eight original Mughal-e-Azam show cards was originally designed for publicity of the color re-release of the film but never ended up being used. Showcards are used as pin ups on notice boards inside foyers of cinema halls. Printed on thick stock photo paper for easy pin up display, this rare surviving set of original Mughal-e-Azam show cards was actually issued to a cinema hall that screened the film in 2004, making it highly collectible! All eight show cards featured here for sale are sealed inside their original carrying case and are in mint unused condition. Mughal-e-Azam stars Prithviraj Kapoor, Dilip Kumar and Madhubala in lead roles and has the distinction of being the most expensive Hindi film ever made in Indian cinema. It is consistently ranked in polls as the greatest Hindi film ever made in Indian cinematic history. 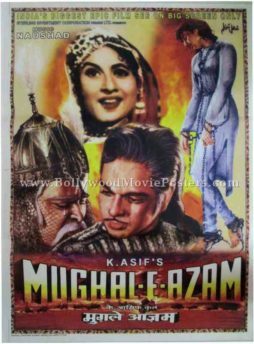 Mughal-e-Azam held the coveted title of 'highest grossing Hindi film of all time' for a full 15 years after its first black and white release in 1960, making this color re-release poster very collectible! Directed by K. Asif and produced by Shapoorji Pallonji, Mughal-e-Azam is an epic film unanimously regarded as a milestone in Indian cinema. The soundtrack of the film is credited as one of the best in the history Bollywood and continues to be played till today. 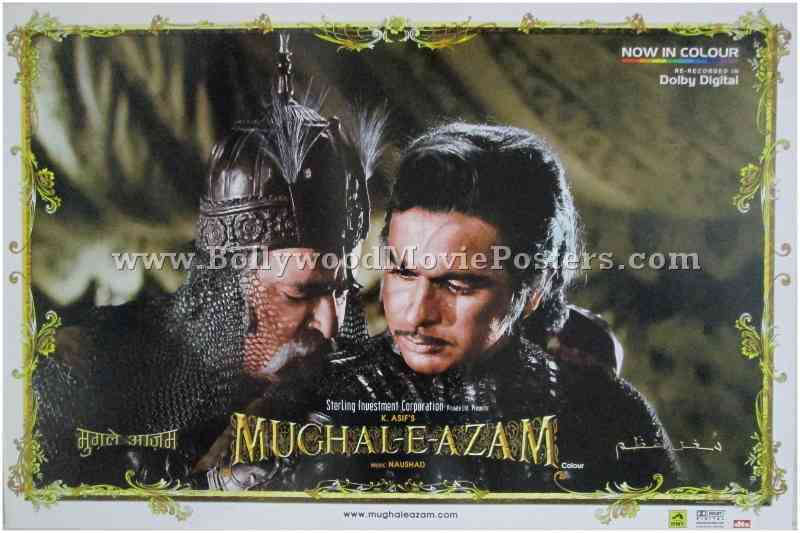 Original Mughal-e-Azam poster for sale of the 2004 color re-release of the epic 1960 black and white film. Mughal-e-Azam is the first full length black and white feature film in the history of Indian cinema to be colorized for a theatrical re-release. The film’s color version was released theatrically on 12 November 2004, with a digital reworked soundtrack. 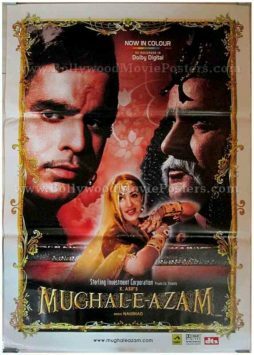 Printed and circulated in 2004, this glossy Mughal-e-Azam poster was originally designed for publicity of the color re-release of the film but never ended up being used. 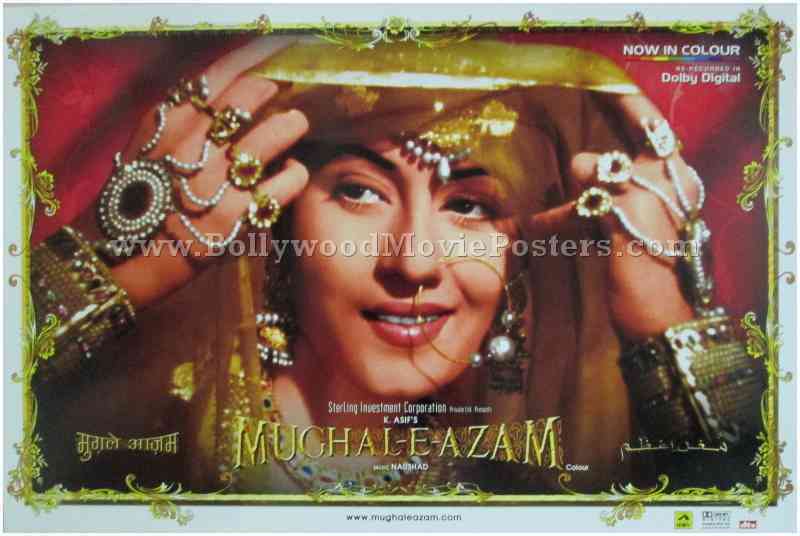 This glossy Mughal-e-Azam poster features a stunning photograph of Bollywood’s eternal beauty queen, Madhubala. A beautiful gold motif border is seen adorning the sides of this Madhubala poster. 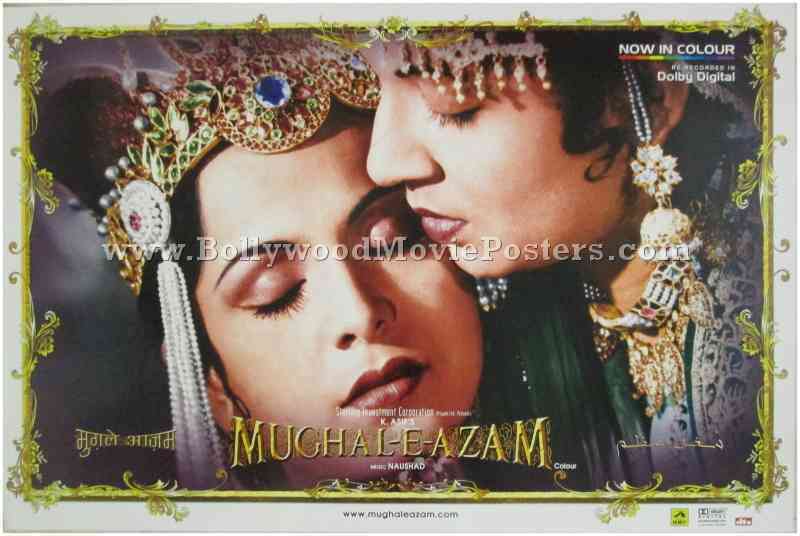 Mughal-e-Azam held the coveted title of ‘highest grossing Hindi film of all time’ for a full 15 years after its first black and white release in 1960, making this color re-release poster very collectible! Mughal-e-Azam original poster for sale of the 1960 black and white cult blockbuster movie that is unanimously considered as one of the greatest Indian films ever made. 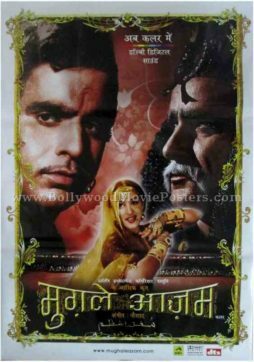 Printed and circulated in 2004, this Mughal-e-Azam original poster was designed for publicity of the color re-release of the film but never ended up being used. Prithviraj Kapoor, Dilip Kumar and Madhubala, the three lead actors of the film are seen in this Mughal-e-Azam original poster. Mughal-e-Azam has the distinction of being the most expensive Hindi film ever made in Indian cinema. It is consistently ranked in polls as the greatest Hindi film ever made in Indian cinematic history. 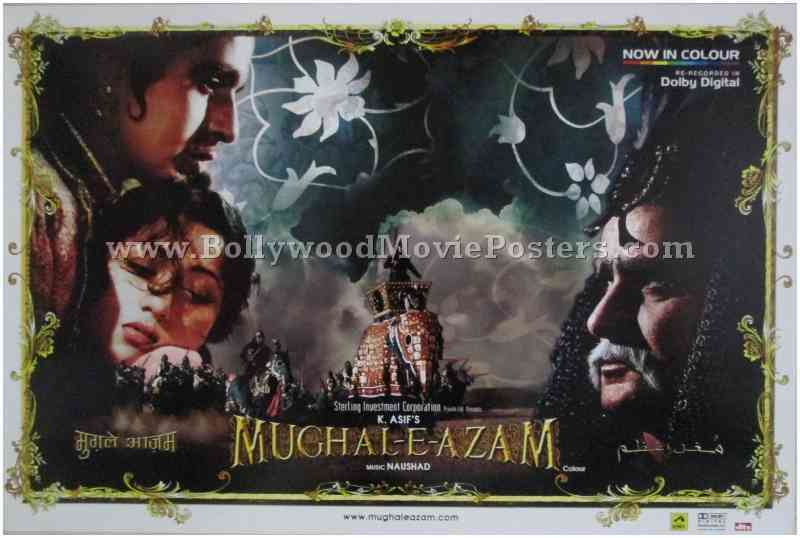 Original Mughal-e-Azam poster for sale of the 1960 black and white film’s 2004 color re-release. 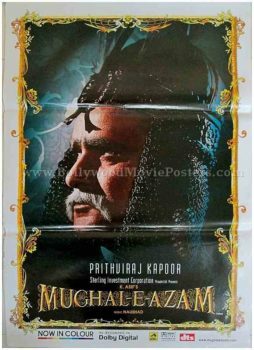 Printed and circulated in 2004, this original Mughal-e-Azam poster was designed for publicity of the color re-release of the film but never ended up being used. Prithviraj Kapoor and Dilip Kumar are seen in a hand painted avatar inspired from the original Mughal-e-Azam poster of the 1960 black and white release. A large hand painted portrait of Madhubala in chains is seen on the right. 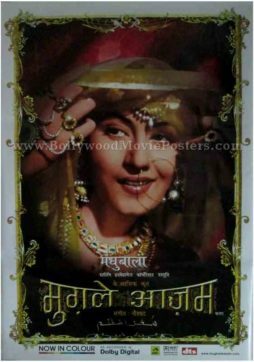 The top of this original Mughal-e-Azam poster shows a photographic still of Madhubala in a smiling avatar. Original Mughal-e-Azam (2004) Bollywood poster for sale. 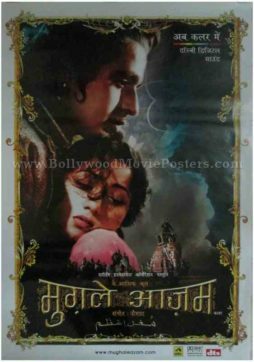 Printed and circulated in 2004, this glossy Mughal-e-Azam Bollywood poster was originally designed for publicity of the color re-release of the film but never ended up being used. This glossy Mughal-e-Azam Bollywood poster features the three leading actors of the film, Prithviraj Kapoor, Dilip Kumar and Madhubala. Large side profiles of Prithviraj Kapoor and Dilip Kumar are seen flanking either side of the poster while a dancing Madhubala appears at the center. A beautiful gold motif border is seen adorning the sides of this Mughal-e-Azam Bollywood poster. 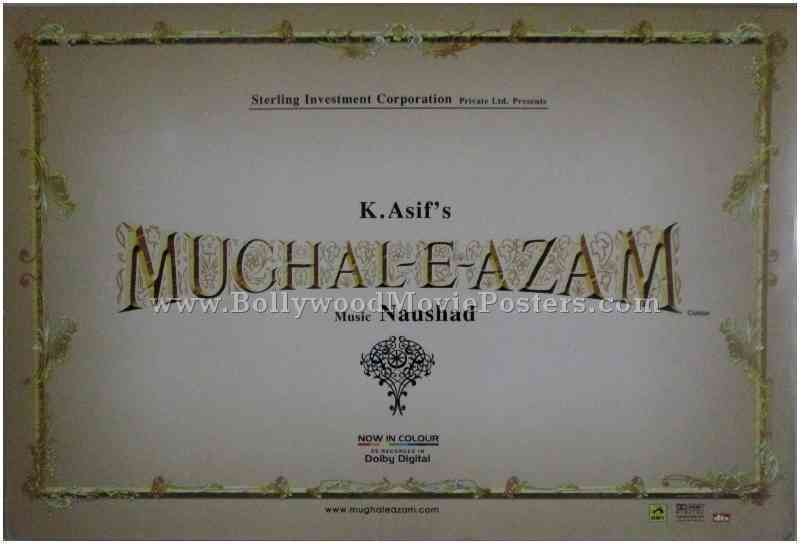 2004 color re-release original Mughal-e-Azam movie poster for sale. Printed and circulated in 2004, this glossy Hindi film poster was originally designed for publicity of the color re-release of the film but never ended up being used. Mughal-e-Azam is a 1960 Bollywood epic directed by K. Asif and produced by Shapoorji Pallonji. The film stars Prithviraj Kapoor, Dilip Kumar and Madhubala in lead roles. 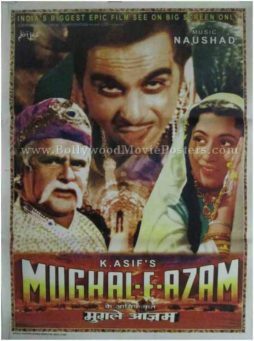 Mughal-e-Azam held the coveted title of “highest grossing Hindi film of all time” for a full 15 years after its first release in 1960. It is an epic film unanimously regarded as a milestone in Indian cinema and has consistently been ranked in numerous polls as the greatest Hindi film ever made in cinematic history. The soundtrack of the film is credited as one of the best in the history Bollywood and continue to be played till today. 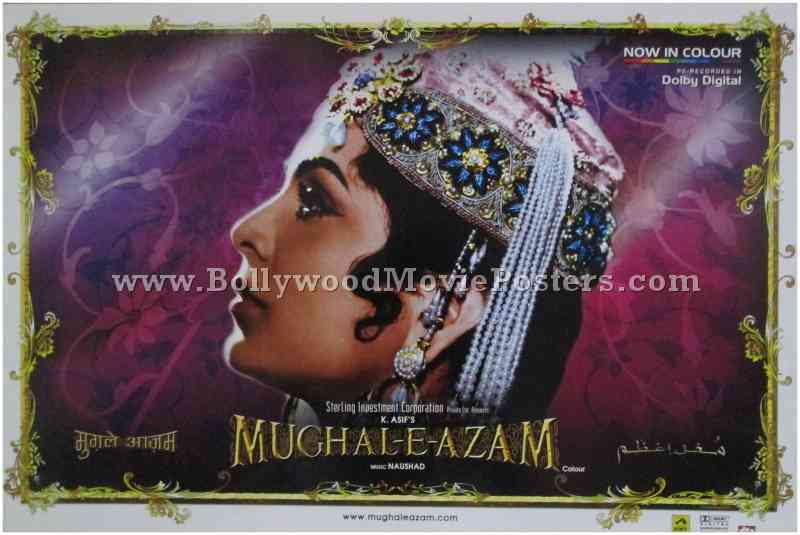 Original Bollywood movie poster of the 2004 color re-release of Mughal-e-Azam for sale. Printed and circulated during the color re-release of the epic film in 2004, this glossy Bollywood movie poster was originally designed for publicity of the film but never ended up being used. Mughal-e-Azam stars Prithviraj Kapoor, Dilip Kumar and Madhubala in lead roles and has the distinction of being the most expensive Bollywood movie ever made in Indian cinema. It is consistently ranked in polls as the greatest Bollywood movie ever made in Indian cinematic history. 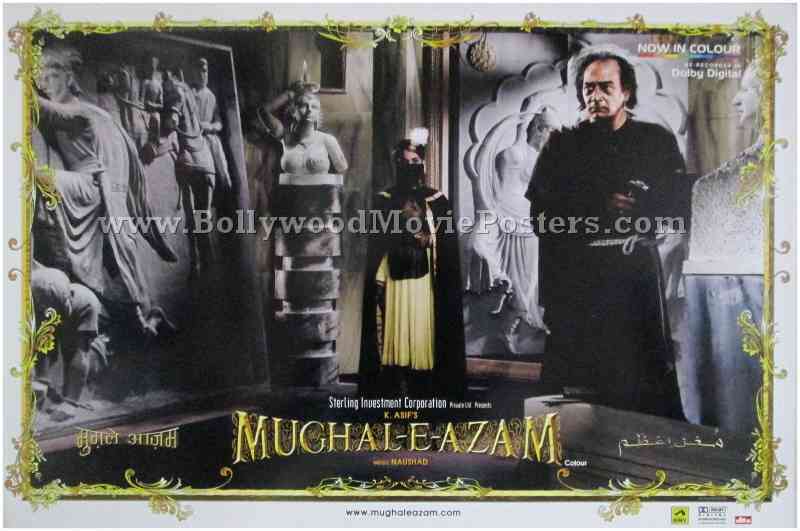 Mughal-e-Azam held the coveted title of ‘highest grossing Bollywood movie of all time’ for a full 15 years after its first black and white release in 1960, making this color re-release poster very collectible! Mughal-e-Azam is a 1960 Bollywood epic directed by K. Asif and produced by Shapoorji Pallonji. The film stars Prithviraj Kapoor, Dilip Kumar and Madhubala in lead roles and has the distinction of being the most expensive Bollywood movie ever made in Indian cinema. Mughal-e-Azam is an epic film unanimously regarded as a milestone in Indian cinema and has consistently been ranked in numerous polls as the greatest Bollywood movie ever made in cinematic history. The soundtrack of the film is credited as one of the best in the history Bollywood and continues to be played till today. 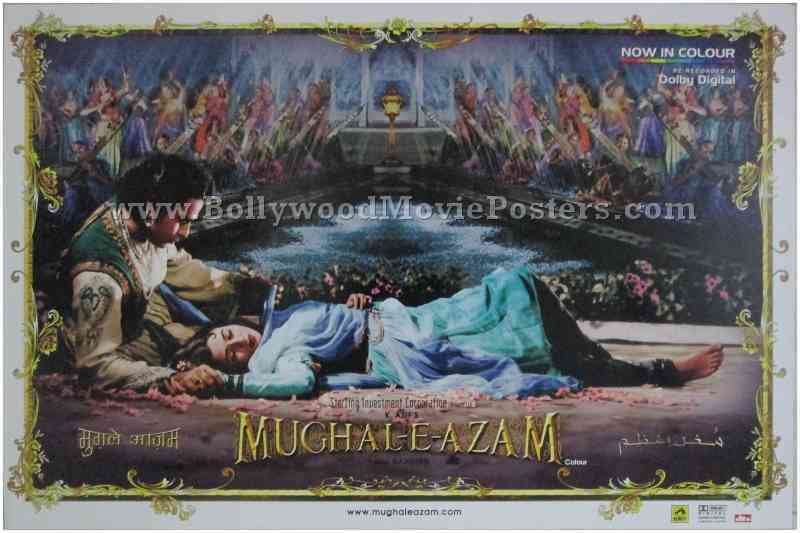 2004 color re-release original Mughal-e-Azam film poster for sale. Printed and circulated in 2004, this glossy Mughal-e-Azam film poster was originally designed for publicity of the color re-release of the film but was never used.